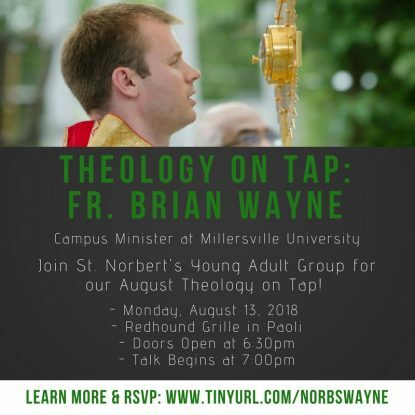 Father Brian Wayne will join the St. Norbert parish young adult group for “Theology on Tap” discussion on Aug. 13 from 6:30 to 9 p.m. at the Redhound Grille in Paoli. As the campus minister to Millersville University, Father Wayne oversees numerous spiritual, service, and social opportunities for students on campus, including Mass each Sunday evening, daily adoration, small groups and Bible studies, mission trips, parties, dances, movie and game nights, and numerous outings. Doors open at 6:30 p.m., and the talk will begin at 7 p.m. The topic of discussion will be announced that evening. The Redhound Grille is located at 128 Paoli Pike in Paoli. Happy hour drink and taco specials will be available from 5 to 7 p.m. in the bar area.